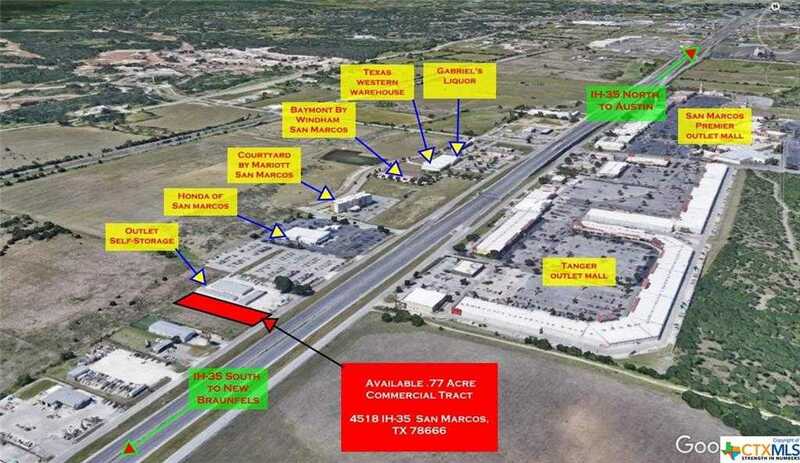 Development Potential with IH-35 Frontage. Utilities Present. Zoned for Future Development / Light Industrial District (LI). Neighbors include Tanger Premier Outlets, San Marcos Premier Outlets, Courtyard by Mariott, Honda of San Marcos, Outlet Self-Storage, United Rental, and Amazon Fulfillment Center. &#xD;&#xA;&#xD;&#xA;Light Industrial Use May Include: Bottling/Brewery/Winery, Storage Facility, Contractor's Storage, Food and Beverage Products, Lawn/Tree Services, Sheet Metal/Welding/Machine/Tool Repair Shop, Stone/Clay/Glass/Plastic and Concrete Products, Woodworking including Cabinet Makers and Furniture Manufacturing&#xD;&#xA;&#xD;&#xA;Aerial Photos Coming Soon. In the Process of Verifying Zoning/Sewer with City of San Marcos. Development Potential with IH-35 Frontage. Utilities Present. Zoned for Future Development / Light Industrial District (LI). Neighbors include Tanger Premier Outlets, San Marcos Premier Outlets, Courtyard by Mariott, Honda of San Marcos, Outlet Self-Storage, United Rental, and Amazon Fulfillment Center. Light Industrial Use May Include: Bottling/Brewery/Winery, Storage Facility, Contractor’s Storage, Food and Beverage Products, Lawn/Tree Services, Sheet Metal/Welding/Machine/Tool Repair Shop, Stone/Clay/Glass/Plastic and Concrete Products, Woodworking including Cabinet Makers and Furniture Manufacturing Aerial Photos Coming Soon. In the Process of Verifying Zoning/Sewer with City of San Marcos. Please, send me more information on this property: MLS# 360690 – $509,900 – 4518 Interstate 35, San Marcos, TX 78666. I would like to schedule a showing appointment for this property: MLS# 360690 – $509,900 – 4518 Interstate 35, San Marcos, TX 78666.